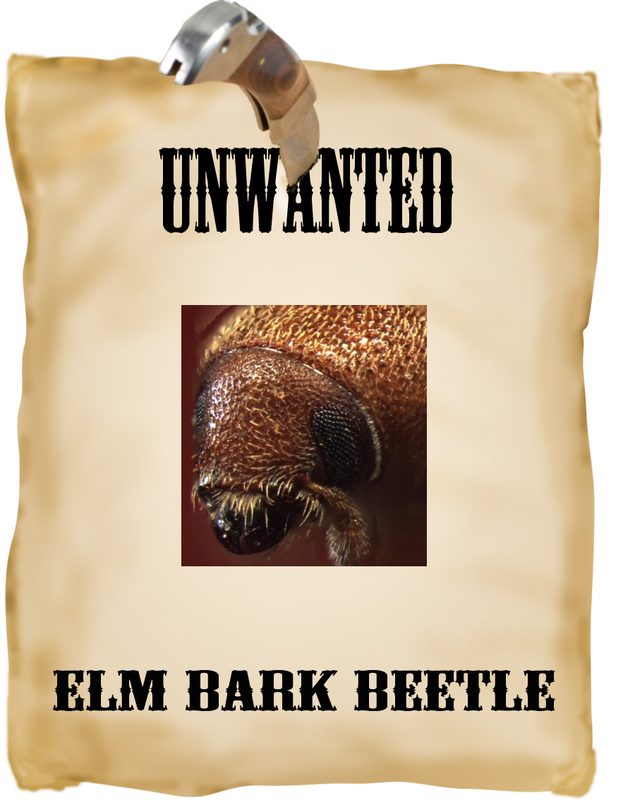 Our reverse countdown of the 10 Most Unwanted Pests continues with #5: the Elm Bark Beetle. 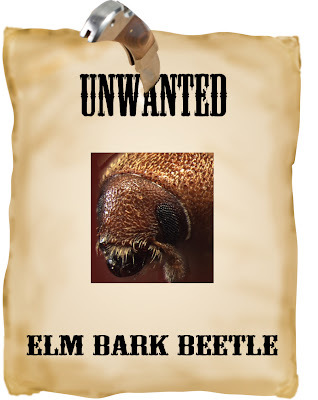 Elm Bark Beetles are mass murderers, responsible for the devastation of the American Elm population – up to 99% of elms have succumbed in some areas. 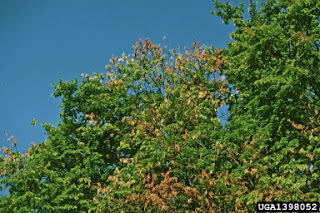 Once the go-to urban tree, the rows of stately elms that lined our streets and shaded our parks have disappeared due to the Dutch Elm Disease transmitted by these beetles. European Elm Bark Beetles (Scolytus multistriatus) and the Native Elm Bark Beetle (Hylurgopinus rufipes) make their home – and their meals – beneath the bark of trees. The beetles penetrate the bark and bore through to the sapwood. Once inside, they gouge out galleries for their eggs. The larvae develop beneath the bark of the tree and expand the galleries to eat the underside of the bark. these galleries as they feed. 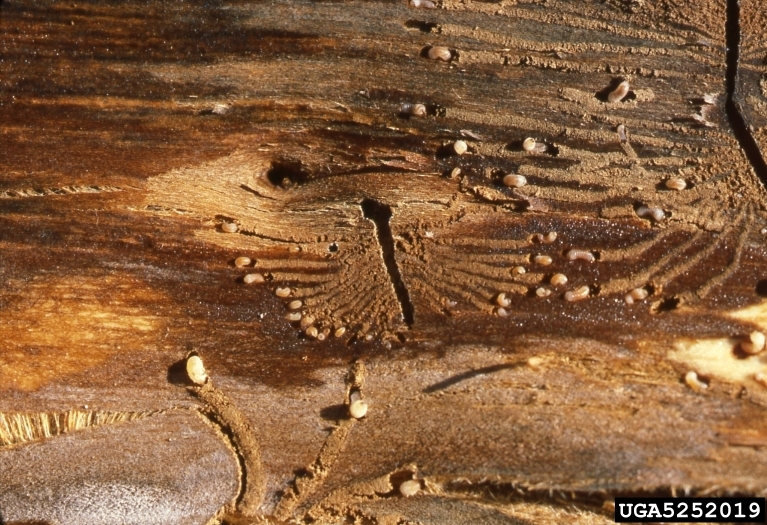 Unlike most bark beetles that target soft-wood trees, the Elm Bark Beetle targets the hard-wood American Elm. The beetles typically lay their eggs in elm trees that are already weakened or beginning to decay. This means that Elm Bark Beetles would never have made our Unwanted list on their own: their larvae rarely do substantial damage to a healthy tree, and controls are available to fight these infestations. It is the adult Elm Bark Beetle that is causing so much such fatal damage. Although most of their lives are spent in weak trees, they fly to feed on healthy trees as part of their life cycle. They carry the fungus that transmits Dutch Elm Disease from the failing tree to its healthy neighbor. Once the fungus enters the elm tree it starts to clog up the tree’s xylem – the aquaduct system inside the tree. The tree responds by trying to seal off the infected xylem tubes with its own clogging mechanism: this is why one of the first signs of Dutch Elm Disease is a yellowing patch of canopy as a branch stops providing water to it. Elm tree branches affected by Dutch Elm Disease. Can Dutch Elm Disease be stopped? Not currently. But individual trees can be maintained in good health for a long time – and a fortunate few never succumb. The first step in prevention is keeping elm trees healthy. Beetles are most attracted to trees that are already stressed, so a regular program of watering and fertilization is important. Dutch Elm Disease also spreads less quickly in a well-watered tree – greater hydrostatic pressure can help slow it down. There are also inoculations that can slow the progress of Dutch Elm Disease. The earlier the better. So it’s extremely important to monitor elm trees for any signs of infestation or canopy yellowing. In the early stages, pruning can remove infected branches before the disease spreads to the rest of the tree. Finally, if you have an elm tree that is beyond saving, it should be removed immediately. The wood must be disposed of appropriately and the stump removed. The roots should also be severed if other elms are near, to prevent the disease spreading through root connections.